"As a breast cancer survivor, and business owner, we at The Scrubbies Company are proud to support Breast Cancer research through the sales of our pink products. Our pink Hearts honor survivors, and the memory of those who battled this disease. The Scrubbies are a multi layered, multi use scrubbing pad. Because of its unique design, its layers can be peeled away as they wear, to expose a new layer ready for use. It's pourous material allows for quick drying. It is great for use in the kitchen, bathroom, and outdoors. A portion of the sales of our pink products will proudly be donated to breast cancer research." These scrubbies remind me of the ones my grandma used to make for me. Those scrubbies got used for a very long time and worked wonderfully! As soon as I saw the scrubbies I thought this. I think The Scrubbies Company must have had a grandma with the same skills. Guess what, they do!! "The Scrubbies Company was formed in 2008 by Tabatha and Jesse Archer. 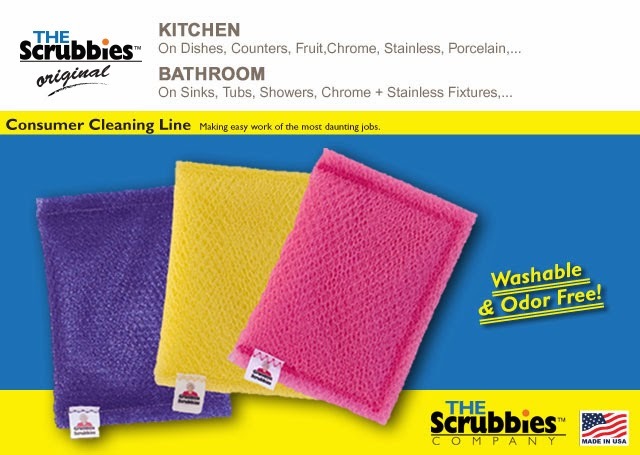 The first Scrubbie was made in the mid 1970's by their Grandmother Louis. The Grandma Scrubbies seen today are still the original design made by their grandmother 35 years ago. The Archer's have been manufacturing American made products for over 17 years. The Archer family has been designing and testing The Scrubbies for over 10 years to ensure its quality standards." These scrubbies work great for doing dishes, for scrubbing the porcelain in bathtubs and showers, for getting in-between the tiles on floors, and so much more. They are small so you can hold them in your hand easily and not be struggling with a flimsy sponge. $4.95 each, these scrubbies will outlast the competitors products as they really are made to last. The QT Scrubbies line has scrubbies for face and body care. These are a little more gentle than the housekeeping ones, but are fantastic for exfoliating and getting off that dead and dry skin. They form to your hand making it easier to get those hard to reach places. These are Made in the USA which is a company I definitely support! Scrubbies seem like a wonderful product that I would love to use. I like the idea of peeling away the used layers! So glad they are donating sales from their pink products. I like that they are made in the USA also.